Latanya Lee cast her vote at the Downtown West polling station in Knoxville. KNOXVILLE, Tenn. – In a state with historically low voter turnout, early and absentee vote totals more than doubled the number from the 2014 midterm election and voters seem more motivated by issues – ranging from tightening the border to expanding education spending — than the candidates. While voting at Farragut Town Hall in Knox County, Mitch Burnett and his wife Peggy, said that their votes were based on their support for stronger border security and respect for police officers. They voted for Republican Marsha Blackburn instead of Democratic former Gov. Phil Bredesen in the race for the seat being vacated by retiring Sen. Bob Corker, a Republican. A public school teacher in Tennessee, Mary Nipper said she voted early for Bredesen at the Downtown West polling place because he supports educators. “He’s very moderate and he makes decisions based on issues,” she said. In Knox County, the final totals for early voting – reported at 117,750 votes– broke records and surpassed the 2014 midterm election early voting numbers. The records for high early voter turnout display Tennessee voters’ level of motivation to cast their ballots. Fran Daniels, a social studies teacher in Farragut, was more concerned with the increase in voter turnout than the success of one political party or candidate. “I hope people turn out regardless if they think their party will win or not,” Daniels said. After early voting ended in Tennessee on Nov.1, the Secretary of State’s office reported over 1,378,840 early and absentee votes cast. In the 2016 presidential election, that number was 1,689,989. In the 2014 midterms, only 634,364 absentee and early votes were cast – more than half of this year’s totals with nearly a week left until Nov. 6. In this election, Blackburn has not been a likable candidate and Bredesen, while popular as governor, is still a Democrat running in a red state. But the strong pull of issues that matter to them brought many voters to the polls despite their feelings about the Senate candidates. Farragut resident LeighAnna Colgrove brought her daughter to the polls so she could witness the voting process. Colgrove said her vote in the Senate race was driven by important issues affecting her and her daughter’s life. “There’s some people on the ballot with good views on education and health care,” Colgrove said. The Cook Political Report calls the race a toss-up. Real Clear Politics’ average of multiple polls gives Blackburn a more than 6 percentage point lead over Bredesen. But over the summer and into September, Bredesen had a lead of as much as 6 percentage points over Blackburn; the lead closed during Justice Brett Kavanaugh’s confirmation hearings. Some voters were disappointed when Bredesen announced he would have voted to confirm Justice Kavanaugh if he had been in the Senate. Alesa Grant, 53, said she was offended by Bredesen’s support for Kavanaugh, but she still voted for him because she believes he will improve health care and the economy. “I never liked Phil Bredesen but now he’s our only hope,” Kraft said. Timothy Hickman, a conservative voter in Knoxville, felt much the same about Blackburn. “I held my nose when I voted for the Senate race,” said he said of his vote for Blackburn. But he wanted a senator who would uphold President Donald Trump’s agenda. 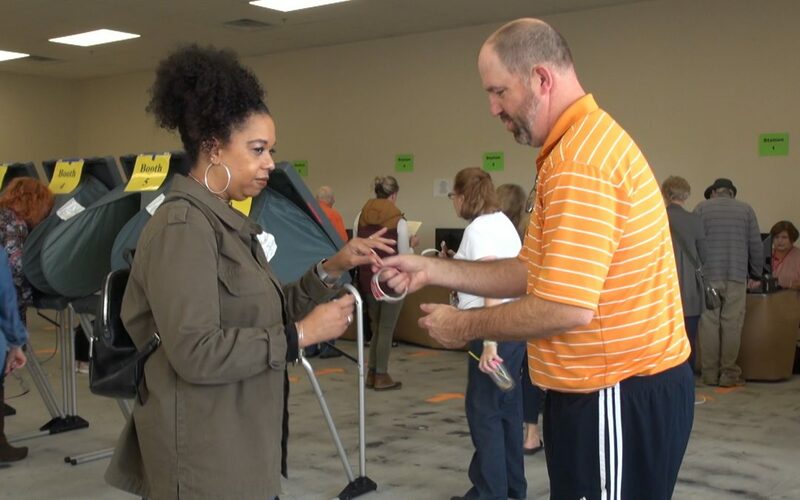 One central theme for many early voters in Knox County was their hope that elected officials would address political polarization and the harsh rhetoric that permeates politics. Bredesen supporter Gail West cast her ballot early because she felt it was her civic duty. She hoped the negativity in politics would end with the election of unifying politicians in Congress. In Farragut, Mark Larsen said his greatest concern as voter was the effects of partisan politics in Washington. “I think in general the stuff that’s going on in Washington kind of concerns me because it’s so much adversarial and that type of thing,” Larsen said. Early voting in Tennessee ended this week, a few days before Trump’s Nov. 4 visit to Chattanooga, Tennessee to campaign for Blackburn.